This is not your mama’s meatloaf. This is not even your mama’s seitan loaf, tofu turkey, or nut roast. It doesn’t taste like meat. It doesn’t even pretend to have the texture of meat. 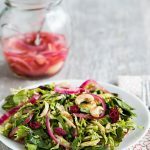 But if you like savory, Thanksgiving flavors so concentrated that you can just skip the gravy and dressing, you will want to give this recipe a try. I was inspired by the Comfort Loaf in Robin Robertson’s Vegan on the Cheap*, but instead of using vital wheat gluten, oatmeal, and bread crumbs, I decided to make my loaf gluten- and grain-free. So it’s brown and slightly crispy on the outside like a traditional meatloaf, but the inside is almost as tender as mashed potatoes, partly because it does, in fact, contain mashed (sweet) potatoes. 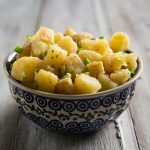 The heady flavor and aroma come from the holy quartet of fall herbs–parsley, sage, rosemary, and thyme–and believe me, they will have you singing! *If you’re interested in the original recipe, I highly recommend getting a copy of Vegan on the Cheap. Please visit my Thanksgiving Recipes page for all of my holiday dishes, from side dishes to desserts. If you don’t follow a gluten-free diet, you may be especially interested in the Mushroom Seitan Roast and Seitan Stuffed with Walnuts, Dried Cranberries, and Mushrooms, both great Thanksgiving main dishes that will impress your guests. Wash a medium sweet potato (about 7 ounces), pierce it several times with a fork, wrap it in a paper towel, and microwave until done, 4-5 minutes. (Alternately, bake or steam the sweet potato.) Allow to cool enough to handle and then peel and set aside. Mince the onion, celery, and carrot. 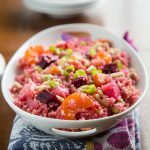 You can do this quickly by cutting each vegetable in quarters and then pulsing in a food processor until finely chopped. Heat a large, non-stick skillet. Add the minced vegetables, including garlic, and cook, stirring regularly, until they become tender, about 6-10 minutes. Add water by the teaspoon if necessary to keep the vegetables from sticking or becoming dry. Once they’re softened, add the drained beans and mash them lightly with a slotted spoon or spatula. Place the peeled sweet potato into the food processor along with the tofu, soy sauce, and all seasonings, including nutritional yeast. Process until fairly smooth. Add the walnuts and pulse a few more times. Scrape the tofu mixture into a large mixing bowl and add the quinoa flakes and the cooked vegetables. Stir well. Preheat oven to 375F. If you have a silicone baking mat (recommended) place it on a baking sheet. Otherwise line the baking sheet with parchment paper or spray with non-stick spray. Spoon the tofu mixture onto the prepared baking surface, using dampened hands to shape it into an oblong or oval loaf about 2 1/2 inches high. Bake for 25 minutes or until the top is evenly browned. Loosely cover with aluminum foil and cook for 20 more minutes. Check to make sure that the center is firm; if not, give it a little extra time. (You can also remove the foil and cook for 5 more minutes for a crunchier crust.) Remove from oven and allow to stand for 10 minutes before slicing and serving. Serving Suggestion: Serve alone or with Mushroom Gravy on the side. Without walnuts: 266 calories, 32 calories from fat, 4g total fat. Made this last night for a belated Canadian Thanksgiving. I thought it would be easier to puree everything in the blender, veg and all, rather than dirtying another mixing bowl; I used oats instead of quinoa; and I baked it in an 8×8 pan. Like a few other people it never set up, after an hour and a half it was still the consistency of hummus. I decided to take it out of the pan and spread it in a thin layer on a large baking sheet to bake some more, in the meantime we ate the rest of dinner. Once in a thin layer, it did crisp up a bit and there was much laughter about the Thanksgiving Veg Bark – I mean, it tasted good, but not what I was going for. I’ll have another try at it later, since it does taste good. 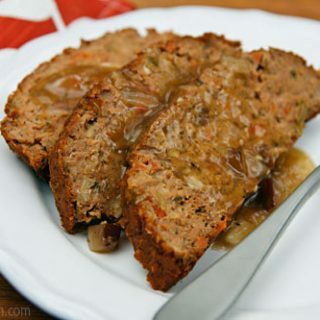 I have another loaf I make sometimes (this one: http://vegweb.com/recipes/thanksgiving-meat-loaf) which has never had a problem setting up. The rest of the family really hates mushrooms though, and in the UK it’s difficult to find onion soup mix. I think about doubling the starchy bits (whether oatmeal or breadcrumbs or quinoa or whatever) and leaving out the beans might help. I used water-packed tofu this time, but have always used silken for the other loaf so I might try that as well. I wonder if adding guar gum or xanthan gum to it would help. I usually have good results putting oats in my meatlessloaves though. Try the above binders. This looks amazing! I have a question though, I found another recipe where a loaf was wrapped in a puff pastry but I like the ingredients of your loaf recipe better. Do you think this would turn out okay baked in a puff pastry?? I haven’t tried it, so this is just a guess. If it’s possible to cook the loaf first and then wrap it in puff pastry and cook again just long enough to cook the pastry–that might work. This is a pretty moist loaf, and I just worry that the pastry might get soggy if you cook them together. The pastry also might get overdone in the length of time it would take to cook the loaf. Do you think this could be adapted for a slow cooker? To free up the oven for the carnivores? I have a bad feeling this would be too mushy in the crockpot. I made this and the mushroom gravy. My husband declared it a “keeper”, so it is in my recipe notebook under favorites to be made again. Thank you. I still make this for Thanksgiving for my vegetarian & vegan daughters – amazing favor! all the meat lovers go back for seconds as well! I just made this today and the whole family loved it! I skipped the walnuts, didn’t have sage and used oatmeal – both flavor and texture came out great! I baked them shaped like meatballs and both my super-picky toddler and picky husband went for seconds and thirds. I had wanted to try freezing leftovers, but there’s just a few left! 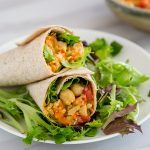 Shared the link to your recipe in my favorite groups and with a few vegan friends. I made this and it the flavour was great but it was not nearly sturdy enough to cut into slices. It was just kind of a blob. I want to bring this to a pot luck and be able to serve as a loaf. Any suggestions? Have you cooked this in a loaf pan? Think that would help? I don’t think baking it in a loaf pan is the main solution. It sounds like there was too much moisture, so I would increase the quinoa flakes or oatmeal to at least a full cup. Then if you want to bake it in a loaf pan, it may come out better. I have at home only firm tofu. Do you think it will be ok? Yes. Increase the quinoa flakes or oatmeal by 2 tablespoons just to be on the safe side. Happy post-Thanksgiving. I just had to write and say I made the meatless loaf yesterday, and it was fantastic!! I had a recipe for a port wine mushroom gravy that I put on top. Just FYI, I used the quick oats over the quinoa flakes (they were too expensive at my local CoOp..). It was perfect for Thanksgiving, and I can see making it again because it was so hearty and flavorful. But festive? Definitely. Oh, I forgot to add that I also opted to use the walnuts. Glad I did. You’d get an occasional nice crunch as well as the added flavor. I know that this recipe has been on your blog for quite a while, but I just got around to trying it for our Thanksgiving dinner. It was delicious! I paired it with your mushroom gravy, as suggested, along with yams and asparagus. For dessert I made a cranberry/carrot cake off of the VegKitchen website (minus the 2 T. of oil) and frosted it with Vegan Richa’s cashew cream frosting. It was quite a feast. Your recipes have never failed me. I especially like your Beany Sausage Patties (I add them when I’m serving spaghetti with marinara sauce) and your Applesauce Ginger Cake. Thank you for the work you put into this blog. It is much appreciated. This recipe looks great! I have an allergy to beans. Could I substitute brown rice or maybe more tofu for the beans? What a treat to have this in March! I left out the thyme because I keep forgetting to buy thyme leaf. And your food is airborne today – I gave a few slices to my friend to take on his flight to New York. ! I served it with green salad with the honey lime cilantro dressing. Great meal and happy Marchgiving! I made this for Easter yesterday. I was so excited because I had successfully timed my cooking to have all 4 dishes complete at the same time! I had let the loaf bake for an additional 30 mins and was beautifully browned. We got everything transfered into serving dishes. I then went to cut into the loaf and it was complete mush past the outside… My heart just sank. After the initial shock my husband and I just laughed while putting a helping of ‘loaf’ on our plates and put the rest back to bake for awhile. The flavor was amazing and my husband is immune to the idea of texture so he was a fan. We just moved so I am not sure if it is the new oven or that I used oats. I am sure I will make this recipe again. When I do I think I may just add a bit more oats is all. (Including microwaving the sweet potato) I cooked it an additional 10 minutes and it turned out perfect! I made it with mushroom gravy and steamed broccoli, but it also makes a great cold meatloaf sandwich. Thanks for all you do, I really appreciate having access to your wonderful recipes. Why do you say it’s soy free when it contains tofu and soy sauce? I am looking for a great soy free (TOTALLY NO SOY, tempeh, or tofu) recipe. thanks for suggestions — there are soy allergies in my vegan family. Here’s another one that is almost soy-free: https://blog.fatfreevegan.com/2012/04/dreenas-no-fu-love-loaf.html. It contains tamari, but you can use coconut aminos in it, too, or just leave it out and add a little salt. I like making Meatless Loafs of all kinds. So I am going to make this soon. Probably this weekend when Rosalind is home from work. I easily found the quinoa flakes in the cereal isle at Whole Foods. This looks and sounds absolutely delicious. Thank you for including the Mushroom gravy recipe with it. Oh, wow! This looks absolutely amazing! You are one smart cookie. It looks delicious! For tofu, have you ever tried chickpea flour tofu? As used in Indian cooking? I need to check it out. Just wondering. We tried this for dinner this evening. I cooked it a cake tin and it made enough for 2 ‘cakes’. When I cooked it, I roughed up the top with a fork which made it nice and crispy and I kept the cooking time the same as in the recipe. It had a great taste but it needed more texture. Next time, I think I will increase the veggies and reduce the sweet potato and tofu. Thank you for a tasty recipe which was enjoyed by veggies and non-veggies alike. This is a bit silly, but are the spices dry or fresh..making 2 loaves with no tofu and just cannellini beans..Do I need to change any ingredients, i.e…oats? All the herbs are dry except for the parsley. The ingredients should be the same with the beans instead of tofu. Susan, you are my family’s favorite cook! Made this for lunch and holy cow– it’s SO delicious and simple to prepare. It has all the flavors of stuffing, but with more nutritious ingredients. I added an extra 1/2 C. of quick oats after reading other comments. Texture was perfect. This will definitely be on our holiday menu this year. Thank you! This was excellent! I made it for Sunday Dinner to test out for Thanksgiving- made a wild mushroom “gravy” to go with it-everyone loved it, even the carnivores! I had no problem with it setting up- although I didn’t have cannilinni beans so I used pintos, and I really cooked them dry with the veggies so maybe that helped it not be too soft or wet. Making again and sharing with vegan sister! Hi Susan! Can I make this the day before I want to serve it? How would I go about storing it and reheating it? Thanks! Sure! Just store it covered and reheat it in the oven. Start with it covered for 15 minutes at about 350 and then remove the cover and bake for 5 minutes or until warm throughout. I had the same issue with the consistency being off. I had to bake it for like an additional hour and the outside kept getting crusty while the inside barely booked. I think the issue is I pureed my veggies more than minced which released too much liquid and I didn’t think to add more oats. But I’m still not sure if it would have helped. The taste is ok but not exactly what I was looking for. Can this be made ahead and if so how many days? Can it be frozen? I would think you could make it several days in advance. I also don’t see any problem with freezing it. Hello. I’m tempted to make this for Thanksgiving this year. Can it be prepared the day before and then baked the next day? Thank you! Yes it can. Be aware that this is a softer loaf, more like stuffing than meat loaf. I plan to serve this for Thanksgiving, so I tried it out a couple of times, once with all beans, and once with tofu and beans. I think I prefer the all bean version because of the texture. I loved the flavor and think the walnuts really add something. 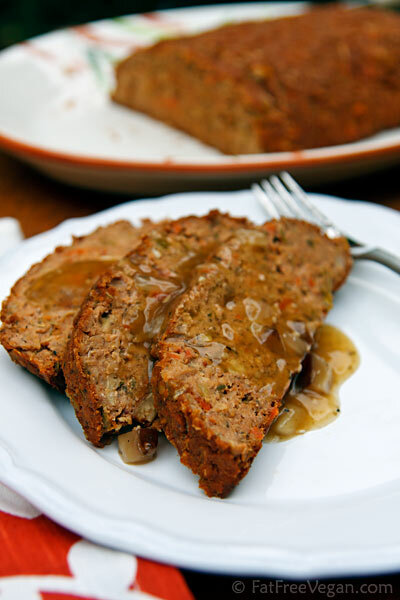 I have tried oh so many meatloaf recipes and been disappointed with all of them – until now! I made this with what was in my cupboard so I used borlotti beans instead of canellini and as I don’t eat soy I used butter beans instead of the tofu. I used oats as I didn’t have quinoa flakes and used whole grain mustard and sunflower seeds instead of the walnuts (my nephew is allergic to nuts). It was so good I even got a thumbs up from my husband! Thank you, thank you, I was running out of time to veganise Thanksgiving. 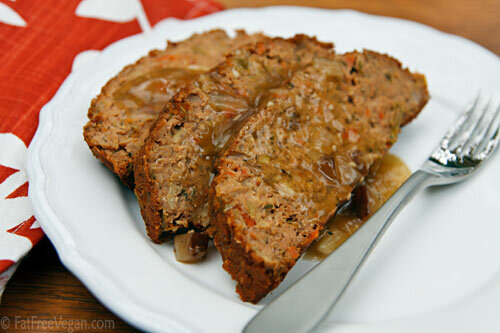 So the thanksgiving table this weekend will be vegan Mushroom Wellington and this meatloaf. It was not bad, but just not tasty. I baked for 1.5 hours and it still fell apart. I was hoping it was going to work out so I could make it again and serve it at Thanksgiving for my non-eating family members. Not going to happen. Can i use my loaf pan to cook it in or would it not cook through.? Check the other comments to see if anyone has had success cooking it in a loaf pan. I really believe it needs a large surface area exposed in order to cook right—-to get the outside crisp and cook off the moisture. Am i crazy or do you not list what to do with the tomato paste? Excited to try this! You’re not crazy; I didn’t name it because I considered it one of the seasonings. I probably should spell that out. We made this for a vegan Thanksgiving dinner yesterday. It tasted great, but we also had issues with it not baking in the center at all. It seemed plenty thick enough when I formed it into a loaf, held it’s shape no problem, so I thought it had enough oats. I sliced it and put it back in the oven while we started eating the rest of dinner. We had used oats instead of the quinoa, which seems to be consistent with some of the other reviews that didn’t come out. I wonder if this may be the root of the problem? Anyway, a good recipe, but definitely allow extra time to bake. If I were to make it again, I might try forming into “meatballs” as another review mentioned. Hi! For us tofu newbies, maybe include info in the recipe that the tofu has to be “prepped”. Had my daughter not been with me when I made it, I wouldn’t have known to squeeze the excess liquid out of it and it would have been mush! It was delicious but crumbly because I over baked it, thinking it wasn’t firming up enough. A little sweet and savory meatloaf sauce solved that problem. Thank you! Hmmm, I don’t really press the water out of tofu for recipes like this one. Obviously you can, but I’ve never found it necessary. I just make sure to pour off all the water in the tofu container. I made this on Thanksgiving. Great taste and texture! It reminded me of turkey stuffing. Some meat eaters were over for dinner and they all had some – and liked it. I used a can of red beans (that’s what I had). Added about 4 tablespoons of flax meal to make the loaf firmer. I cooked it at 325 for about 1.5 hours along with the turkey breast I was making for the meat eaters. Thanks for posting it! Been making this every Christmas for the past 4 years (without the tofu). It is now my go-to Christmas dinner. 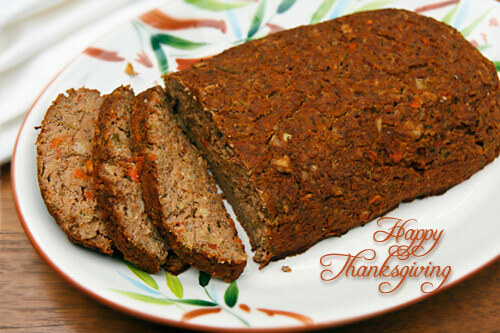 When I tell people I make a vegan meatless loaf for the holidays, they turn up their noses and laugh. Then when they smell it and try it, their attitude changes. Thanks, Susan! I made this a number of years ago and although it took way longer to cook than anticipated as it never firmed up, I remember it being extremely delicious though. I am considering making it again but I need a nightshade-free recipe. I’m wondering how it would be without the tomato and paprika. Do you think I would need to substitute anything? I would just increase the other seasonings a little. Hope you enjoy it again! Hi! We recently went *plant-based* and I’m already anticipating what to make for Thanksgiving. This loaf looks delicious! Wondering though if instead of forming it and baking as a loaf, to instead spread it on a baking sheet to bake-through more thoroughly, then perhaps cutting and stacking slices to look more loaf-like upon serving? Think that might work? We make this every Thanksgiving and it is very good. I usually add a few mushrooms for a meatier taste. Can I just tell you how much I love this recipe? I looked it up again today because we are hosting a vegan family from India who wants the traditional Thanksgiving flavors. The rest of our crew wants turkey. But if I actually make this in addition to the gobbler my family insists on, I’m doing the vegan thing. I served it four or five years ago when my vegetarian parents came for Thanksgiving. That year, I got away with making it the centerpiece of our meal and buying a frozen packaged turkey breast from Trader Joe’s for my poor kids and husband (LOL, They didn’t mind, but I took one look and knew it would be awful.). So, here’s to you, Susan! You do great work!!! Made this today….quite tasty, set up well but need more ‘tone’ to the bite…something to firm it up a bit. I used oatmeal and thought I should add extra but made the recipe as per instructions for a ‘base’ to evaluate changes for the finale to be made this Thanksgiving. – Thinking about either Flax or perhaps a few tablespoons of wheat gluten, once again, trying for more bite. – Might add a small bit of something with a touch of spice to it…perhaps 1/2 tsp of a pepper sauce? I followed this to the letter. I got mush… and honestly the flavor was not the best. I tried to redeem it by slicing it and cooking it longer. Honestly it was in the oven for about an hour and a half and still mushy. I would definitely add some kind of binder, maybe chickpea flour instead of the white beans. It also needs flavor. MORE SPICES. Sorry but I will not be making this again, I feel like I wasted money. Made this last night as a test for Thanksgiving. I formed a big loaf and a very small loaf so that I could try it first. Since that’s less than a week away, I was wondering if I can freeze this. I know I can, but I”m not sure how to reheat without drying it out. Do you have any advice on this? I haven’t tried freezing it, but I think that as long as you keep it well-covered it shouldn’t dry out. Hope you enjoy it on Thanksgiving! Hi! I have a no-meat ball dish with eggplant and mushrooms I use at Thanksgiving time, but was intrigued by this. I made it by doubling the cannellini beans (w/o tofu) and used quinoa (not flakes). It was delicious! BUT it didn’t set up firmly enough. I can try the flakes or quick oats, but what should I reasonably expect as far as firmness? I think it should hold up to the knife without falling apart. It should be firmer with quinoa flakes or oats, but some people haven’t found it firm enough. I would try using a 1/4 cup more if the flakes or oatmeal. Either one of those options should work. Set aside extra time when you cook it, especially if it’s been refrigerated.